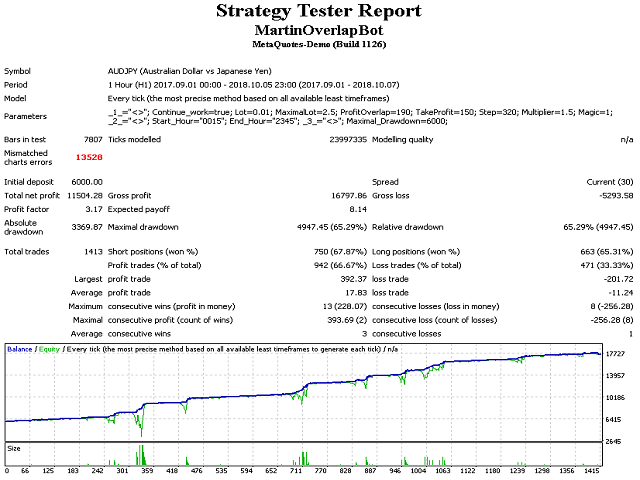 Fully automatic trading strategy that does not use any indicators. This system is suitable for 4 and 5 digit brokers. At the very beginning of trading, two multi directional orders are placed with the lot specified in the settings. Then the martingale principle is included in the work. The orders are closed or by the specified take profit line (for purchases-blue, for sales-red) or a new order is opened at the specified distance from the previous one. Profit is achieved by closing the entire network of orders. 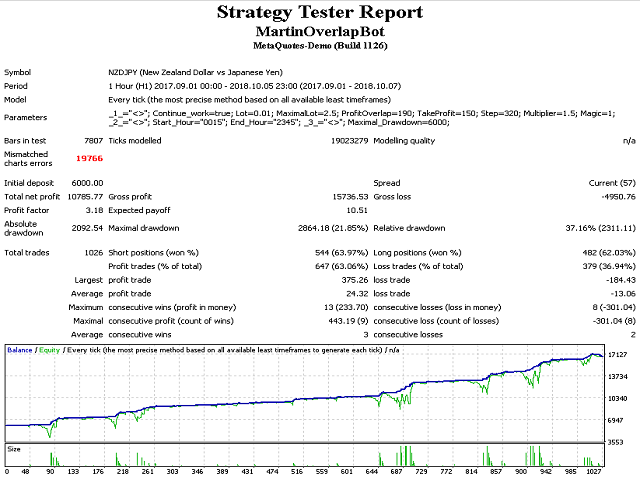 The peculiarity of the expert Advisor is that the take profit levels for the broker remain invisible. Another feature of the expert - this is a decrease in the total floating drawdown, due to the overlap of losses of the initial orders with the profit of the latter. Continue_work - Continue (true) or not continue (false) the trading cycle. In the Continue_work=false mode, the EA does not place new orders. The rest of the orders follow in the normal mode. They are closed in averaging or overlapping mode according to the algorithm . Start_Hour - Time to start trading. Written in the format HHmm (for example, 00:15 will be as 0015). End_Hour - Time to stop trading. Is written in format HHmm (for example 23:55 will as 2355). After the end time, the EA will pause until the start time. 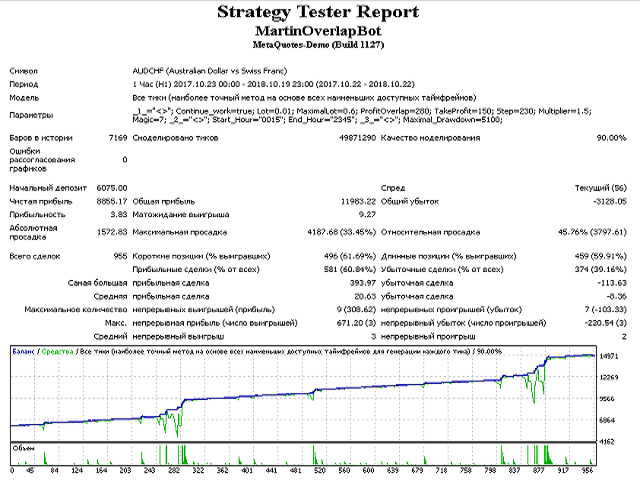 Maximal_Drawdown - Maximum drawdown (in Deposit currency). After the occurrence of this event all orders are closed forcibly on the current chart. For convenience, I added a dashboard that shows statistical information about the current state of the account. On the panel you can see the settings that are currently running (this is done to exclude any user errors. For example, the same magic on different charts, etc.). If you want to stop trading, but the open positions remain on the chart, the EA will display a message in the information panel: "Stop trading; Positions in the process of closing". Once the robot will close all positions, then will appear the inscription: "All positions locked". After that, you can remove the expert from the chart. I added this for convenience, because several robots can work on one chart of one trading instrument. And before it was not clear whether the robot stopped working or not. Whose these positions are: the positions of a remote robot or another robot. To diversify risks, I recommend using the expert Advisor simultaneously on different accounts that are open in separate terminals. For this purpose I increased the number of product activations to 10. Thank you for your interest and good luck in trading! 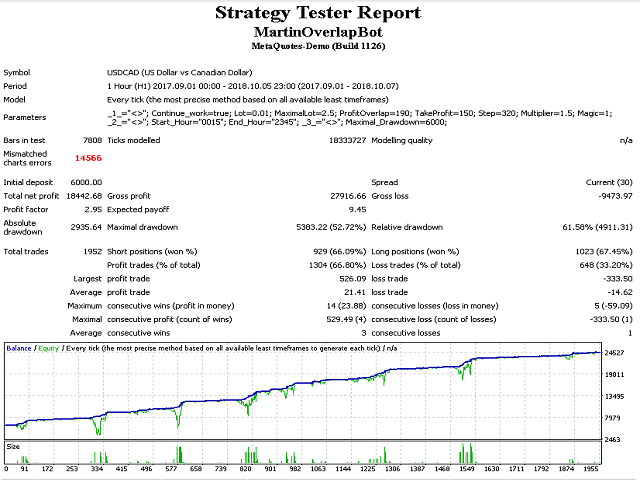 Using proper risk management and frequent withdrawals, this can be a very lucrative little bot. Thanks Mikhail! Added the ability to continue or not to continue the trading cycle. If you do not continue the market orders are closed in the normal mode and new ones are not placed. Added the ability to start and pause the EA at the specified time. Added the ability to close all market orders when the drawdown specified in the settings is reached.